Ride the Ducks for an Awesome Spring Break! 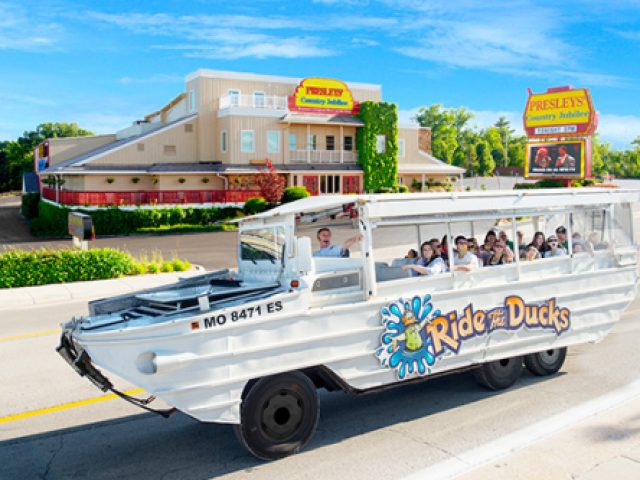 Ride the Ducks Tours is a great way to enjoy a great outdoor fun in Branson as it will definitely impress everyone onboard as the journey covers many interesting spots in Branson. This unique water adventure with the Ride the Ducks provides every guest a fascinating sightseeing experience with full of vitality that can let you enjoy a truly exciting outdoor fun in Branson both in land and in water. This amphibious vehicle gives you the chance to explore the pristine and crystal clear waters of the Table Rock Lake and Lake Taneycomo as the duck travels across the beautiful landscape of the Ozarks. As you take this amazing adventure ride on the water, you’ll get to enjoy an exciting water activity you won’t forget. Ride the Ducks Tour offers guests two different tours that each depart from two different locations. The Table Rock Adventure is the first tour that departs from the Strip in Duck Central of Wal-Mart in Branson. This fascinating sightseeing tour allows you to see the spectacular views of the Table Rock Dam, the panoramic landscape around the Ozark Mountains, and the famous entertainment district of Branson. As the duck departs, it will then climb up to the top of Baird Mountain and splashes down to the pristine waters of Table Rock Lake. The second tour Lake Taneycomo Adventure starts its journey from the Duck Central in Branson Landing and it will travel through the heart of Branson, College of the Ozarks, Branson Landing and splashes down into Lake Taneycomo for fits final stop. This exciting outdoor fun in Branson that you can experience with the Ride the Ducks covers a total of 70 minutes which 25 minutes of it is spent on the water. For those who are planning to join the tour are advised to reserve tickets in advance. The tour tickets that you will get include a tour to some famous attractions in Branson such as Titanic Museum or Dolly Parton’s Dixie Stampede Dinner and Show. This amazing adventure tour with the duck can accommodate big group of guests, making it a great place to hold a get-together party with friends. Ride the Ducks tour have about 18 amphibious vehicles that are used daily and each duck can accommodate up to 35 passengers. As a participant to the Ride the Ducks Tour, you shouldn’t be worried about your safety on the amphibious vehicle as each duck is beautifully designed and built with durability and stability, and the water speed won’t exceed 7 mph giving you a smooth and peaceful journey on the water. As you board the duck, you are assured to enjoy an exciting, wonderful and fun water ride without getting wet. With the very slow and smooth travel, you will never get seasick. So, if you want to enjoy an exciting outdoor fun in Branson by taking a journey on the lake and through the foothills of the Ozarks mountains, take an adventure tour with the Ride the Ducks in Branson.